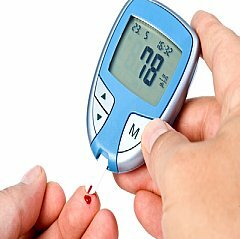 Type 2 Diabetes Symptoms - Signs of high blood sugar - are you at risk? Are we ALL pre-diabetic now? Type 2 diabetes symptoms are becoming more and more common. It's shocking but true that most people are overweight these days. If you've been overweight for many years, then yes, you could very well have type 2 diabetes already and you are very likely pre-diabetic. Ten percent of the world's population is now reported to have diabetes and the numbers are rising at an alarming rate. I read recently that 80% of adults have high blood sugar which leads to type 2 diabetes. Yet for 90% of the people who have type 2 diabetes it is a disease that can be controlled and even reversed. Are you at risk? Type 2 diabetes symptoms first of all are indicated if you have been overweight for a long time. Do you tire easily? Do you have fuzzy thinking? Do your muscles feel weak? Do you feel emotionally fragile much of the time? Are you excessively thirsty? When you are releasing a lot of urine your body craves fluids. Are you hungry all the time? When your body is burning glucose for energy and storing fat it demands more sugar when your glucose converts to energy. It's what happens when you are eating too many hidden high glycemic foods that are common additives in processed foods. These are the "fat traps" and they are dangerous because they can lead to chronically high blood sugar. Type 2 diabetes symptoms can include visual impairment like blurry vision or dry eyes. Lack of fluid can cause dry eyes but also high blood sugar can cause the lens to swell causing a distortion. Are you getting sick too often? Your immune system is impaired when you are insulin resistant and have too much glucose in your blood. That makes you susceptible to more infections and the bacteria and virus can actually feed on the excess glucose. Do you have tingling in your hands and feet? Excess glucose can actually damage nerves. The first place you may notice it is in your fingers or toes. But there are also nerves in your digestive tract which when impaired could cause nausea, constipation or diarrhea. These are all signs of high blood sugar but being overweight is the most significant factor because it is such a clear indicator. You are storing fat because your body is making too much insulin. This is the time to see a doctor and get a diagnosis. There are other factors that can contribute to insulin resistance or type 2 diabetes symptoms. There may be a genetic propensity for high blood sugar. If diabetes of either type is in your family be aware. Type 2 diabetes symptoms are more prevalent among African Americans, Latinos, Native Americans, Pacific Islanders and Asian Americans while type 1 occurs more often in Caucasians. *You can purchase a blood meter here or from a drugstore and know for sure if your blood sugar is high. Because regular, vigorous activity increases insulin sensitivity it follows that little to no activity can increase the risk of insulin resistance. Muscle tissue uses glucose more efficiently and exercise builds muscle. Age is a factor just because people sometimes slow down and become more sedentary in middle age and also because as our cells age they are less sensitive. You have to work harder with diet and physical exercise to remain healthy. And what you eat is critical! Managing type 2 diabetes means that you need to eat low glycemically. Low glycemic foods do NOT raise your blood sugar. As reported in the medical journal Lancet in June 2011, 200 countries and regions were studied over the past 3 decades for blood sugar and diabetes trends. They concluded that nearly 10% of the world’s adults have diabetes and the prevalence of the disease is rising rapidly! Type 2 diabetes, a preventable condition, accounts for 90% of the cases. This is shocking news and should make everyone wake up to the enormous costs both medically and personally of diabetes. Diabetes increases the risk of heart attack, kidney failure, blindness and infections to name just a few of it's complications. It is a global epidemic that could overwhelm the health care systems of many countries particularly in third world countries. It is generally recognized that medical treatments for type 2 diabetes are not particularly effective although it's always best to see a doctor and get a diagnosis and advice. Ask your doctor about making changes in your lifestyle. Because what can make a positive difference and even reverse type 2 diabetes will be making the necessary changes in eating and exercising and losing fat permanently. You need to eat low glycemic foods and exercise every day. These signs of high blood sugar are your warning. It is your lifestyle that determines whether or not you have type 2 diabetes symptoms! Type 2 diabetes symptoms indicate a high blood sugar condition. YOU have to be the one to take action and change your lifestyle. This is especially important if you have metabolic syndrome symptoms. Especially if you are obese, it is essential to see a doctor often. Medical complications can be very serious. If you have any of these type 2 diabetes symptoms and you are overweight you need to take action. Your focus needs to be doing what you need to do to increase your insulin sensitivity because that is what will ultimately help you to balance your metabolism and hormones, stay slender and be healthy. You CAN do this...all the tools are here. Lifetime Fat Loss is about how to achieve your ideal weight and have great vitality and health for a lifetime. Start by adopting the insulin resistance diet. * This website is not a substitute for a physician's care. Always see your doctor or a health care professional if you are concerned about any medical condition including obesity. The articles below will help you reverse type 2 diabetes! This is a fat blocker that really works to burn fat effectively. Return from Type 2 Diabetes Symptoms to Type 2 Diabetes. Return from Type 2 Diabetes Symptoms to Lifetime Fat Loss home page.